Bhai Sahib was born in 1959 to Mata Balvir Kaur and Sardar Makhan Singh. Of his 5 brothers and sisters, Bhai Sahib was the youngest. He was exceptionally fond of sports and throughout his school years won countless awards. Upon passing the tenth grade, Bhai Sahib enlisted in the army at the age of 18. Throughout his time in the army, Bhai Karaj Singh would spend his time boxing and weightlifting – two sports he excelled at because of his build. Around the time Bhai Sahib was married to Surjit Kaur and had 2 sons, the name of Sant Jarnail Singh Ji was beginning to be heard more and more often on the countryside. Sant Ji was traveling the rural areas of Punjab, encouraging youth to abstain from drugs and other negative influences and instead live positive lifestyles according to the Guru’s glorious teachings. He implored all Sikhs to gather under one Nishaan Sahib and be prepared for the attacks on the faith which were being seen in Punjab so often. Bhai Karaj Singh would regularly visit Sri Darbar Sahib and listening to Sant Ji’s speeches, he slowly became aware of the Indian government’s injustices against the Sikhs. To add salt on Bhai Sahib’s freshly opened wounds, the Brahmanical forces of India launched a full scale military operation on the Darbar Sahib complex in June, 1984. Operation Bluestar resulted in the destruction of Sri Akal Takhat Sahib and the massacre of hundreds of innocent pilgrims – including women, children and seniors. But this carnage alone would not satiate the forces of Indira Gandhi. The armed forces of India went to all lengths to humiliate and break the spirit of the Sikh people. Saroops of Guru Granth Sahib Ji were burnt and shot at, the Sikh Reference Library was destroyed, and young men were rounded up to have their hands tied behind their backs with their own Dastars (turbans) and shot. Bhai Sahib was heart wrenched when he heard new of the attack. He immediately abandoned his army post and joined the Guru’s army. After several months of absence, Bhai Sahib was arrested and sent back to the Army Camp. He was soon released and reposted, but his conscience would not let him sit idle and work for the very same power which committed so many excesses against his brothers and sisters. Bhai Karaj Singh soon joined the armed resistance and began working with Bhai Ranjit Singh Rana. 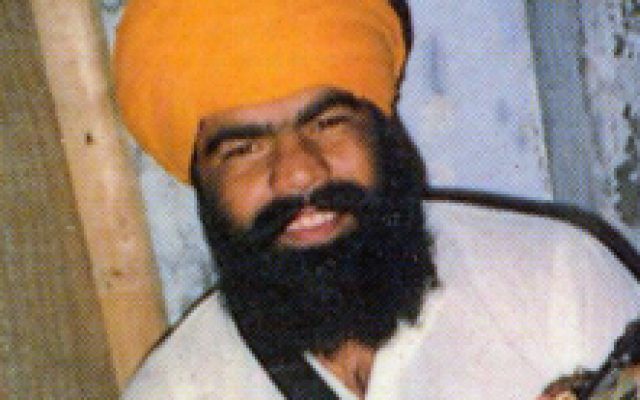 Upon Bhai Ranjit Singh’s Shaheedi (martyrdom), Baba Gurbachan Singh Manochahal appointed Bhai Karaj Singh as Lieutenant General of the Bhindranwale Tigers Force of Khalistan (BTFK) Jathebandi. The shaken government took notice of Bhai Sahib’s courageous actions and decided to put a stop to his Seva. In doing so, Bhai Sahib’s mother was ruthlessly butchered in her own home and when he was not found, a reward for Rs. 100 000 was placed on Bhai Sahib’s head. Bhai Sahib, however, was undeterred from his mission. He had resolved to live according the principle of Puaatan Singhs, “Baaghi Ja Baadshaah.” (Rebel or Ruler – referring to the idea that the Khalsa will always be and will always protect it’s sovereignty). Bhai Sahib had declared his allegiance to Shaheeda-De-Sirthaaj Sahib Sri Guru Arjun Dev Jee Maharaj and would only end his struggle through accomplishment of his task or death. On May 1, 1988, Bhai Sahib visited Sri Darbar Sahib to attend an important meeting of underground Singhs like Bhai Surjit Singh Painta, Bhai Dilbaagh Singh Bagga and Bhai Sukhdev Singh. As the CRP caught wind of the meeting, they cordoned off Sri Darbar Sahib and moved in on May 9, 1988 to follow through with ‘Operation Black Thunder.’ The Indian forces immediately called reinforcement and special commandoes soon joined in on the attack. The Singhs immediately took up their positions; Bhai Karaj Singh had taken command of the Ramghariay Bungay and continued to defend the sacred shrine from being defiled by the Indian forces. Finally, on May 18, 1988, Bhai Sahib’s gun fell silent as he joined the long line of Shaheeds before him.